… it’s because this is what’s on the other side of it. I made the “noel” side of the sign back before Christmas (and blogged about it here.) After I put my holiday decorations away, my porch looked a little bare, which is why I decided I’d paint the flip side of the sign and put it back up. 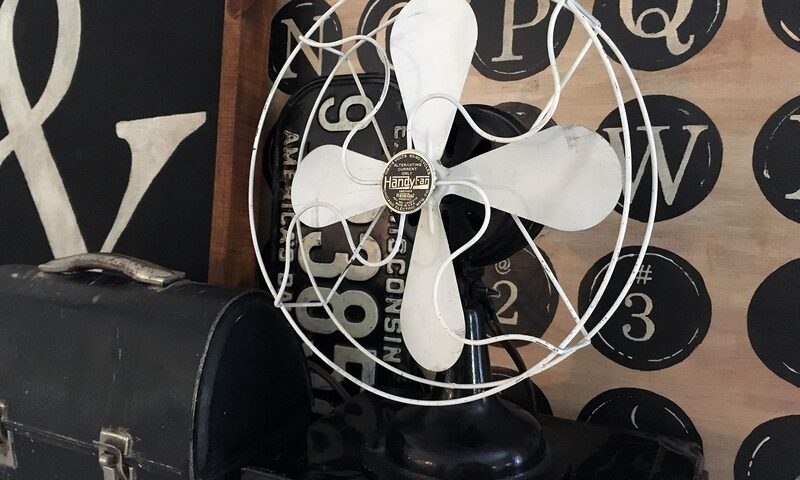 To create my “new” sign, I started by basecoating the back of the old sign with some Folk Art Home Decor Chalk Paint (rich black) that I had on hand. Then I typed up my street address and printed it out. The font I used was Didot. The numbers were huge (1100 points), so I had to tile the pages and scotch tape them together. After that, I just had to fill in the outlines with white paint. I used Rustoleum Chalked (linen white) paint; it took three coats to cover the black base coat. I propped the sign up by my back door in the same spot I had it when the noel side was facing out. It fills in the empty spot on my porch, and it makes me smile every time I walk past it. My mailbox has been in a sorry state for quite a while. Paint was chipping off of both the metal mailbox and the wood post that it sits on. I finally did something about it this weekend, and I didn’t have to spend a penny. I had all of the necessary supplies (half a can of black satin spray paint; a smidge of leftover white primer and paint from the last time we painted the trim on our deck; and a partial roll of low-tack painter’s tape) in the basement. After scraping off all the loose paint with a putty knife and giving the pieces a quick wash, I taped off the red flag and silver metal hardware. Then I sprayed the box with a thin coat of black paint. I didn’t tape off the white post because I was going to paint that as soon as the black dried (and that only took a couple minutes). The satin finish on the mailbox ended up buttery smooth. Next, I coated the post with some white primer (the old-fashioned way: with a brush) and when that dried, I covered the primer with paint (also the old-fashioned way). If you’re wondering why the post has holes in it, it’s because it used to be part of my son’s backyard swingset/jungle gym. When he got too old for it and the set started showing its age, my husband disassembled it and reused some of the pieces. I kind of like the holes; they add a little character to the mailbox. I wanted to paint our house number on the side of the box, so I went inside to create a template in Photoshop. I decided to use Century Gothic and upped the point size until the numbers were 7 inches tall. Width-wise, they just fit on a legal-size sheet of paper. I rubbed a piece of white chalk across the back of the paper, then positioned the numbers where I wanted them on the mailbox and taped them down. To get the chalk to transfer onto the mailbox, I outlined the numbers with a sharp pencil. When I peeled off the tape and paper, the numbers were faint but readable on the side of the box. Unfortunately, some of the paint peeled off along with the tape. (Grrr.) I decided to fill in the numbers with white paint first and worry about touching up the black later. It took a couple coats of white for the numbers to cover the black box. I touched up the spots where the tape had removed the black paint by squirting a dab of the spray paint into an empty plastic container, then painting it on with a detail brush. After I wiped off the rest of the chalk dust, the mailbox was ready for action. There are a couple of tiny tulips just poking up through the ground right now. When it warms up a little more, I’ll plant some other flowers and a vine of some kind there, too, with hopes that the vine will climb up the post.